This is another innovative idea of integrating a WiFi locater into stylish trolley suitcase or laptop bag for fast WiFi hotspot searching anywhere. 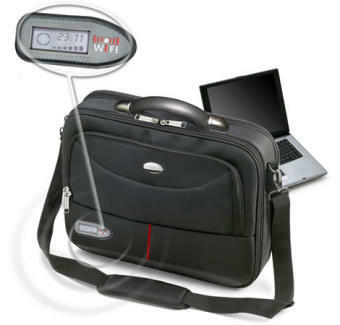 Instead of following the routine steps to unzip laptop bag, take out and turn on laptop just to find out if you are in the hotspot area, now you can just look at the LCD display on the bag to get the quick information on WiFi signal in seconds. Known as Wiffinder, it is one of the high quality full featured products developed by Soyntec targeted for business executives and travelers. With only a single touch on the button, the users will be able to figure out the available WiFi signal surrounding them. Besides, there is also signal bar indicating the WiFi strength for stable network connectivity. To make it more perfect, there are a wide range of products such as trolley bag, executive case bag, university backpack and etc suitable for different working groups. Some drawback, other than the signal bar and clock time display, there is not much details to show if the WiFi signal is encrypted or free on air. This is critical for someone especially those that are interested only on unencrypted WiFi spot for free net surfing. I am just curious, if there is an implementation of this new feature into laptop or PDA that able to alert users with audible tones (even when the laptop is in hibernate mode) when they are approaching WiFi hotspots area, then the Wiffinder could be redundant and potentially losing its selling value.